Taking as their touchstone the influential work of Anne Middleton, whose searching explorations of the dialectical intersection of form and history in Middle English writing lie at the heart of the medievalist’s literary critical enterprise, the essays in this volume address the medieval idea of the literary, with special focus on the poetry of Chaucer, Langland, and Gower. The essays, by a notable array of medievalists, range from the “contact zones” between clerical culture and vernacular writing, to manuscript study and its effects on the modalities of “persona” and voicing, to the history of emotion as a basis for new literary ideals, to the reshapings of the genre of tragedy in response to late-medieval visions of history, and finally to the relations between poets writing in different medieval vernaculars. 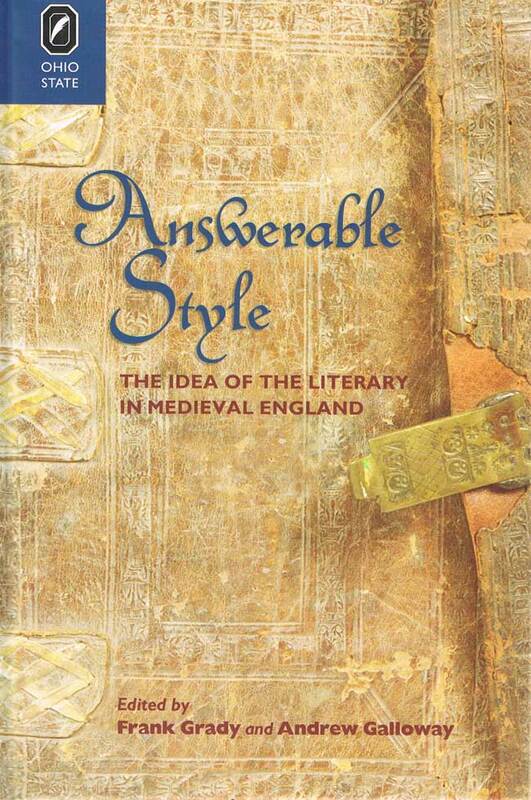 With this unusually broad yet thematically complementary set of essays, Answerable Style offers a set of key critical and historical reference points for questions currently preoccupying literary study. Frank Grady is professor in the department of English at the University of Missouri–St. Louis. Andrew Galloway is professor and currently Chair in the department of English at Cornell University.